The ideal outcome for a chin implant procedure is to have an improved profile and a more attractive jaw line that creates a better balance between your chin and other facial features. Many patients choose to have a chin implant placed at the time rhinoplasty is performed in order to give balance and symmetry to their profile. Dr. Kearney performs chin implants as an out patient procedure and can be done under either local or general anesthesia. An incision is made inside the lower lip or directly under the chin and an implant is placed and then sutured in and the incision is closed. Though performed less often, there is an alternative method for chin enlargement called a sliding osteotomy where a portion of the chin bone is permanently moved forward. Patients can go home following surgery and usually have a small dressing over the chin area where the incision was made. Dr. Kearney will prescribe medication to help control initial discomfort but most patients are able to return to work 3-5 days after a chin implant. Most bruising and swelling is gone within 7-10 days though there may be some tenderness and numbness that can last up to a month. 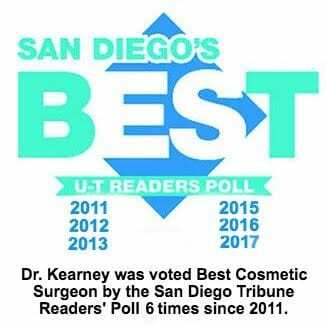 Dr. Kearney and our staff are more than happy to address any questions or concerns you may have about chin augmentation in La Jolla and San Diego. Please contact our office at (858) 677-9352 or fill out our online form.